Registration, all sessions, and most workshops and meals will be held there. All tours and off-site events depart from Conference Hotel. Buses will serve only the Conference Hotel. There will be no "special" pickups at other hotels. Hotel Directions From Santa Fe and the North -Take I-25 S. and take exit 226B to merge onto I-40 W toward Gallup, 2.3 miles. Take exit 157A for Rio Grande Blvd, continue for 0.3 miles. Turn left at Rio Grande Blvd NW. The Hotel Albuquerque will be on the left. Hotel Directions From the Airport and the South -Merge onto I-25 N via the ramp and continue for 3.5 miles. Take exit 226AB to merge onto I-40 West toward Gallup, and continue for another 2.5 miles. Take Exit 157A for Rio Grande Blvd, turn left onto Rio Grande Blvd. Continue for 0.3 miles. The Hotel Albuquerque will be on the left. 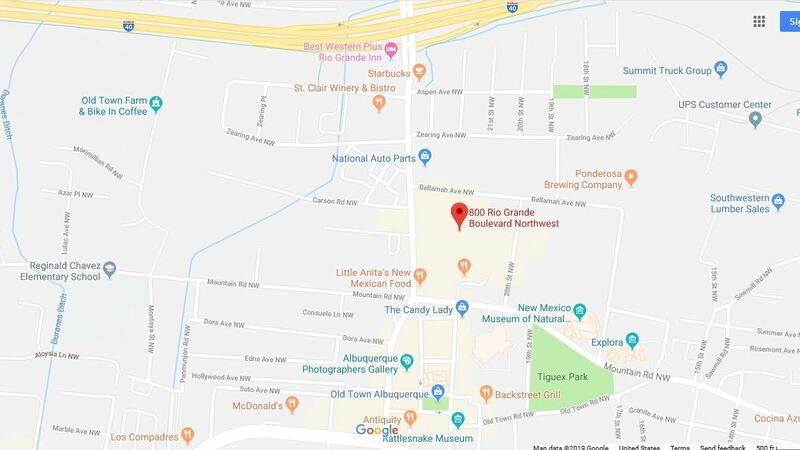 Hotel Directions From the East -Head West on I-40, take Exit 157A to Rio Grande Blvd. Turn left on Rio Grande Blvd. Continue for 0.3 miles. The Hotel Albuquerque will be on the left. Hotel Directions From the West -Head East on I-40, take Exit 157A to Rio Grande Blvd. Turn right on Rio Grande Blvd. Continue for 0.3 miles. The Hotel Albuquerque will be on the left.